My friend Tom, who's a carpenter, built a window flower box that doesn't look like a box, but more like a sconce. When we added the boxes to the house windows, a transformation took place that I hadn't really anticipated. The house looked not just prettier, but warmer and more inviting. Our neighbors stopped by and told us how good the house looks, some of them bought their own version of the planters. Ours are made of wood and look like sconces, but you can get all kinds of window flower boxes. 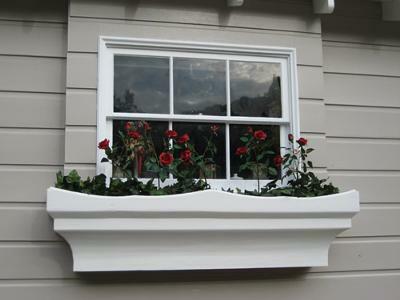 The window planters are very inexpensive and they make a house look beautiful.